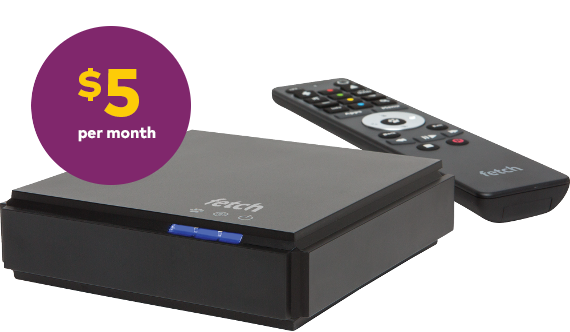 Watch the TV, movies, sport and streaming services you want on the big screen at home with the Mini set-top-box. Subscription and fees apply. For eligible Optus Postpaid Mobile customers. Price applies to first Fetch service only. Min. total cost per month is $40 on $35/mth month to month mobile plan. Perfect as an entertainment hub in the home, the WiFi-enabled Fetch Mini is kitted out with convenient features. Subscription is month-to-month with no lock-in contract. ^Fetch requires an active fixed broadband Internet connection and a download speed of at least 3Mbps, a widescreen TV and an external antenna connection. *Buying content gives you a non-transferable right to use that content, provided you maintain your Fetch Mini service. Data charges will apply from your internet service provider. You cannot use your mobile data to watch content from the Fetch Mini box. If mobile service is cancelled Fetch service will also be cancelled. If the Fetch service is cancelled you must return the device to Optus or charges will apply. Please check if you can add the Mini to your mobile service. Oops! We're unable to locate your details in our system. Please check you have correctly entered your number. If you're a new customer, it may take up to 48 hours after activation for your details to be updated. Hmmm. The details you've entered don't match what we have in our system. Please check you have entered the Account holder details correctly. You have exceeded maximum of three attempts. This verification cannot be processed further. Please try it again after 24 hours. What do I need to get Fetch? How will the Fetch box be activated? The device will be sent with a new Quick Install Guide. Please follow the quick install guide as a technician will not be required. Fetch Mini is charged at $5 per month for your first Fetch service and $10 per month for your second or third Fetch service. The subscription is month-to-month with no lock-in contract. Free-to-air Catch-Up TV and 30 pre-selected 'Movie Box' movies per month. 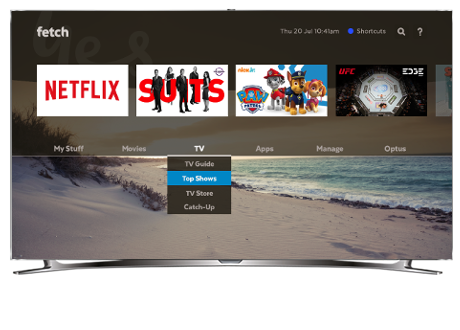 Access to YouTube on TV as well as your Netflix, Stan and Hayu subscriptions. The ability to browse/purchase content from the 'Movies and TV Store' Recording is not available on the Mini. Will the data usage count towards my internet allowance? Data used for watching subscription channels and TV shows, movies and trailers accessed via the Fetch TV Store, Movie Store and Movie Box will be zero rated and will not count against your data usage on your Optus Broadband plan. All other content accessed via the internet on the Fetch service will not be zero rated and will be charged against your data usage on that account, and you may incur data usage charges depending upon your Optus plan. All data usage associated with the service including the purchase and/or download of content will be rated and included as part of your data usage for your broadband service; and You may incur normal download charges and/or excess usage charges depending on your broadband plan. What happens if I cancel or suspend my mobile account? If the mobile account is cancelled or suspended then the Fetch service will also be cancelled or suspended. What if I cancel my Fetch service? There are no cancellations fees for the Fetch subscription. If you cancel the service and do not return the device within the allocated time you will be charged $150 for the device. Can I use my mobile data to watch content on my Fetch Mini? No. You can't tether the Fetch Mini to your mobile device to use mobile data. Can I get premium channel packs on Fetch? Yes. You can subscribe to additional channel packs such as Kids, Vibe, Variety, Knowledge, Optus Sport, BeIN SPORTS, Ultimate and World Channel Packs for a monthly fee. You can add and remove these channel packs anytime you want. Where are the numbers on the remote control? Press the 123... button on the left-hand side of the remote control and the numbers will appear. Can I record, pause and rewind live TV? You can NOT record with the Mini set-top-box. You can pause and rewind but limited to about 20 minutes SD TV before the RAM is filled up. Fetch is available to eligible postpaid mobile customers. Requires an active fixed broadband Internet connection and a download speed of at least 3Mbps, a widescreen TV and an external antenna connection. Data charges will apply from your internet service provider. If the mobile service is cancelled the Fetch service will also be cancelled and you must return the Fetch device to Optus within the allocated time or you will be charged $150 for the equipment and associated costs to Optus. There are no cancellations fees for the Fetch subscription. If you cancel your Fetch service and do not return the device within the allocated time you will be charged for $150 for the equipment and associated costs to Optus. Any purchased content such as Movie and TV store content will be charged to the Optus post-paid mobile bill that is associated with the Fetch subscription. Fetch cannot tether data from a mobile device which means you cannot use your mobile data to watch content from the Fetch. Buying content gives you a non-transferable right to use that content, provided you maintain your service. If you cancel your subscription to the Fetch you will lose access to any purchased TV or Movie content. Actual download speed and in house Wi-Fi performance can be affected by factors such as your equipment and LAN performance, settings, hardware, software, internet activity, location of content accessed and network congestion. Wi-Fi connection may not be as fast or reliable as a wired device, and in some instances PLA power line adaptor devices may be required in place of Wi-Fi to effectively deliver the service. Fetch cannot be used for any commercial business purposes. Network Updates We'll keep you in the loop about any planned repairs and maintenance, outages and other issues. Safe and Secure Payments Order online with confidence. Our connection and site are fully secured with encryption software to protect your personal information. Support When You Need It We've got your back with live social help, online chat and a large knowledge base in help & support.